For the last several years, forest fires driven by agricultural expansion have spiked every summer in Indonesia, creating smog and public health crises , including more than 100,000 deaths , throughout Southeast Asia. While fires are once again flaring , they’re not nearly as bad as usual—there are currently about a quarter as many burning across Indonesia this year compared to this time in 2015. 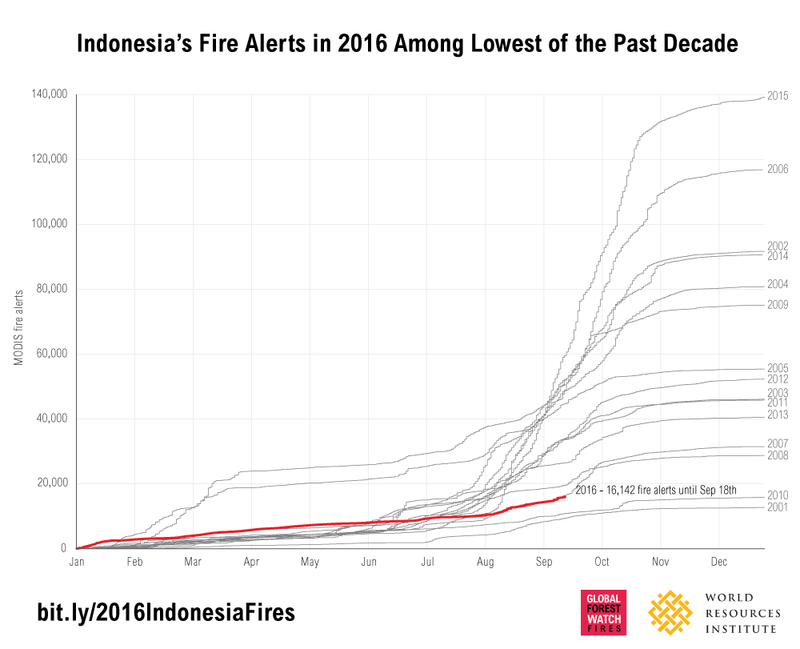 Despite recent outbreaks , fires in Indonesia are three-quarters lower in 2016 (16,128 fire alerts through September 18, 2016) compared to 2015 (61,819 alerts as of September 18, 2015). 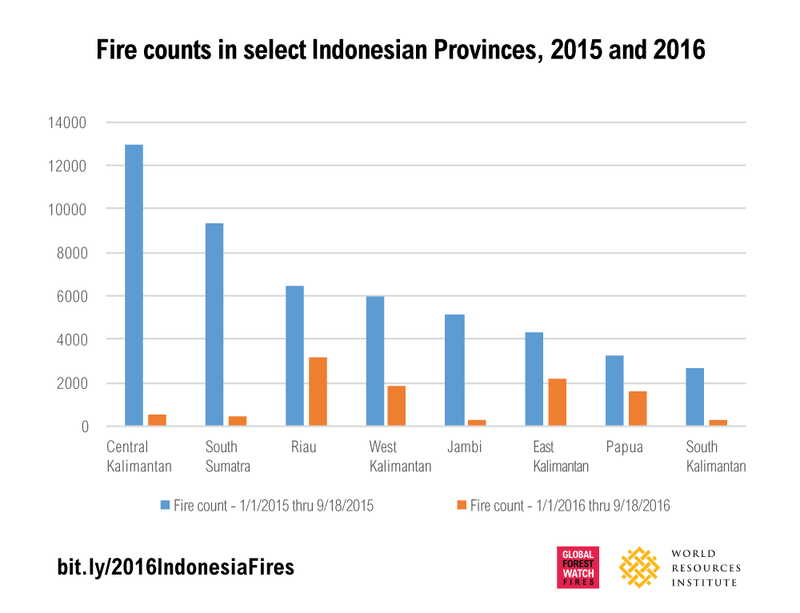 They’ve been remarkably sparse in Central Kalimantan and South Sumatra provinces, which had the highest numbers of fires last year. Last year’s fires also emitted catastrophic amounts of CO2 , as 40 percent of the blazes burned on carbon-rich peatland. This year, that portion is down to 28 percent. These reductions are likely the result of weather conditions and the policy changes implemented after last year’s record-breaking fire season. Last year, the cyclical climate phenomenon known as El Niño  caused dry conditions that allowed fires to spread uncontrollably across Indonesia. These fires begin as small blazes lit to cheaply clear land for agriculture, but every year many grow beyond a manageable scale. This year, Indonesia is seeing wetter-than-usual conditions  caused by La Niña that could shorten the dry fire season and help firefighting efforts. Heavy rains  have already extinguished a recent fire outbreak in Riau, providing relatively swift relief from toxic haze. New and emerging preventive policies and law enforcement measures on the ground may also be helping to fight fires this season. Indonesia President Joko Widodo has taken several steps on that front, including extending  a moratorium on new permits on primary forest and peatlands and establishing the Peatland Restoration Agency to restore hydrology—raising the water table back to the levels they were before the land was drained to reduce the soil’s flammability—on peatlands across the country to prevent future burning. He’s also endorsed a policy  to demote local police and army chiefs who fail to prevent fires—the police prepared cases against 454 individuals and arrested 85  last month— and continues to advocate the One Map  initiative to gather all land-use data in one place. That map will help resolve differences that often cause conflicting licensing, land disputes  and difficulty tracking down those responsible for forest and land fires. Companies are also being held accountable for their part in last year’s fires. The Ministry of Environment and Forestry recently fined oil palm producer PT National Sago Prima a record Rp1.07 trillion ($81.1 million)  and a South Sumatra appeals court found pulp and paper supplier PT Bumi Mekar Hijau guilty  and fined them Rp79 billion ($6 million). The Ministry has also sanctioned 30 companies , temporarily revoking licenses from those found guilty, and is suing 10 more. The contrast to past failed efforts  to hold companies and individuals accountable sends a signal that companies better clean up their act. In response, companies are bolstering their fire prevention efforts. APP, a pulp and paper company that faced enforcement actions  under the Singapore Transboundary Haze Act and in Indonesian courts  for having some of the worst fires on their concessions last year, invested $20 million  in fire prevention and launched a fire Situation Room  earlier this year. These actions are likely responsible for the low number of fires in the company’s concessions this year. Other companies like APRIL, Asian Agri, Musim Mas and Wilmar have joined forces with civil society groups and communities in the Fire-Free Alliance  to provide education on the negative impacts of fires, employ local firefighting units and invest in “no burn village” reward programs that pay villagers to keep their areas fire-free. Even Indonesia’s highest Islamic authority has weighed in , announcing a fatwa (ruling based on Islamic law) that declares it a sin for Muslims to intentionally burn forest. The environment minister hopes this will send a stronger message than any legislation in a country that has the world’s biggest Muslim population, concentrated in fire-prone rural areas. Last year’s fire season catalyzed the strongest response to fires yet, but the current strategies remain short- term and costly. Global Forest Watch Fires data show that while the total number of fires this year is lower than last, fire risk  continues to rise. View on the interactive map . Collaborating with local communities: The Fire-Free Alliance , made up of companies, NGOs and communities, is exploring the use of no-burn rewards, village leaders, educational materials and trainings to stop fires. More of these stakeholders can join the alliance and bring these efforts across Indonesia. Providing land-clearing alternatives: Low-cost access to mechanical land clearing equipment  can steer farmers away from the slash-and-burn method. Communities can also stabilize water levels  to make soil dry enough for oil palm, but humid enough to prevent fires and use fertilizers to boost yields and deter further clearing. Strengthening law enforcement: Although Indonesia has anti-fire regulations and policies, corruption and lack of enforcement have stifled progress. Using innovative technologies in investigations, clarifying prosecution criteria and using more expert testimony can help investigators, police, state prosecutors and judges more consistently penalize perpetrators. 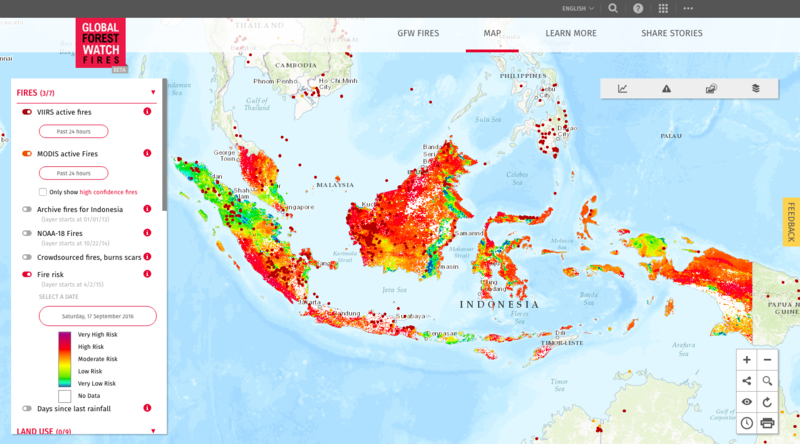 Monitor fire risk and alerts as prevention efforts: The government, private sector, communities and firefighters can use the Global Forest Watch Fires to monitor fire risk and receive alerts on where fires are occurring using near-real-time information. This can help people prevent fires and take action before fires burn out of control. Fire prevention is cheaper and more effective than firefighting. The actions taken in the wake of last year’s disastrous fire season and the favorable weather conditions put Indonesia at a good starting point, but it will take government, companies and local communities working together to make lasting changes.